Paint Love was asked to help with a mural project at Pebblebrook High School in Cobb to celebrate their new academy launch. Pebblebrook, a title I school, kicked off the school year with a new brand of education that engages every student with a choice, and a path to college or career – or both. We wanted to tell this story from the artist's point of view! Give a warm welcome to Paint Love Artist, Lindsay Ryden. Lindsay is a painter and illustrator with an amazing heart. I'll let her take it from here. 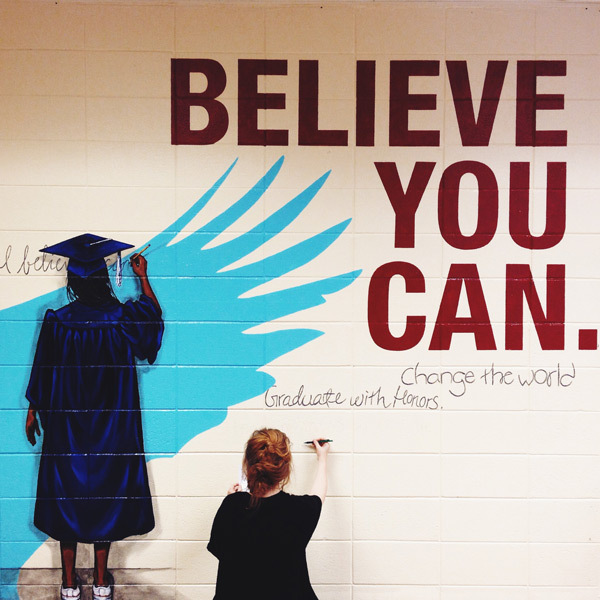 When I volunteered to be the artist for Pebblebrook High School’s new mural, I was excited. I had an opportunity to create a larger-than-life visual for their rebranding. Beyond the rebranding, though, I felt an immediate sense of purpose driving through the heart of the project, from start to finish. I had signed on to something bigger than just a simple rebrand. I was part of a mission, broadcasting a visualization of the future. 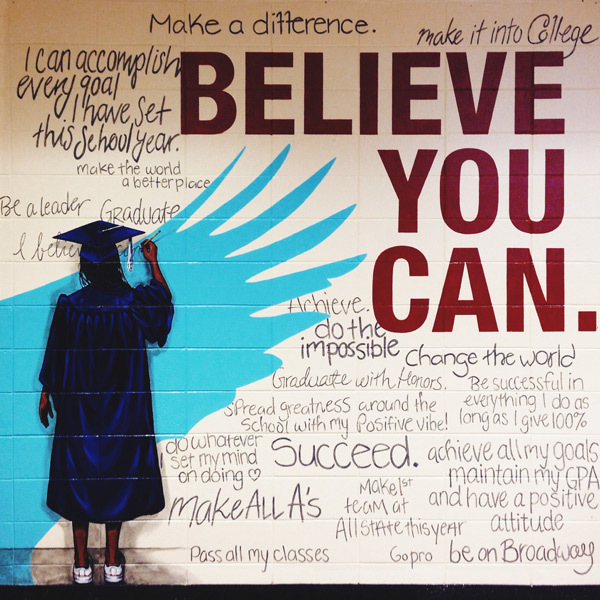 The mural was designed to incorporate the students’ responses to the high school’s new motto, “Believe You Can.” Each participant wrote down what they believed they could accomplish in the school year and beyond. The responses that resonated most with this theme were then recreated, word for word, handwriting for handwriting, onto the wall. I wanted the students to look at the mural and see their words, reflected in their own unique hand. And this is where it got me. As artists, it’s easy to get stuck. Stuck in our own heads, stuck in a job that doesn’t allow us the freedom to be who we were created to be, to go through the motions of the day, without giving serious thought to the intentions driving our actions or to the belief we have in them. Like the students wandering the halls, from class to class, it’s easy to keep our heads down and push on to the next task, our vision dimmed from the busyness of life. But without question or hesitation, those students put the life of their words into a brand new and beautifully fresh perspective. Taking each child’s dreams, quite literally, in my hands—scraps of paper with carefully crafted intentions—and making a public testament to their futures. This is what brought purpose to the work. Seeing the kids light up as they looked at what they had written, permanently fixed onto the wall. Hearing their voices, (whether whispered, yelled or even sung across the hallway…) was inspiration enough. Their voices are heard, and will be heard, every time someone looks at that wall. A physical reminder of what they had set out to accomplish for themselves and for the people in their lives who cheer them on. From dreams of graduation and scholarships, to changing the world and making a difference. Hopes and dreams for the future are far too often kept silent or even repressed, especially now—where everything is filtered through a phone screen or the infinite and impossible standards of idealized beauty. Sometimes, all it takes is a handwritten note, filled with promise, to truly make an impact. "It’s easy to get stuck. Stuck in our own heads, stuck in a job that doesn’t allow us the freedom to be who we were created to be, to go through the motions of the day, without giving serious thought to the intentions driving our actions or to the belief we have in them." I am so thankful that we're able to bring projects like this to life and help the students at Pebblebrook High School tell their story a little louder. A big thanks to Lindsay Ryden! Older PostWe Won 2nd Place in Plywood Present’s Idea Competition!